Our family just got back from car camping this last weekend. No. That doesn’t mean we camped in our car. All it means is that we drove to a campsite, parked our car and unloaded our stuff right there in our camping site. Then we set up a tent and all the other paraphernalia that camping entails and had fun! Backpacking-type camping, on the other hand, involves driving your car to some type of trailhead, but that’s the end when it comes to your car. Then you hike in, set up camp and hike out, carrying everything with you. That’s fun, too. But we’re not at that stage right now because we have young children. Their stuff alone would negate being able to pack light, which is essential when backpacking. But I’m off the subject. What’s new, really? So yeah, we went car camping and it was great. But a lot of people stress about packing and getting ready for a camping trip, or any type of trip, for that matter. This is what I do and what I’ve done for a long time now and it’s saved my sanity on more than one occasion. It’s just 6 simple little steps. #1. Make a list and check it twice. Because I can tell if you’ve been naughty or nice. But we’re off the subject again. Sorry. Really, though. Make yourself a list and then (drum roll, please) this is the magic key. . .
#2. Type said list onto your computer and save it!! I have a vacation folder on my computer and in that folder are several different types of packing lists. I have one for the kids, one for us (the parents), one of things not to forget to do before we leave the house (like turn on the porch light, have a friend get our mail, etc.) and one for things like what food and equipment to bring. 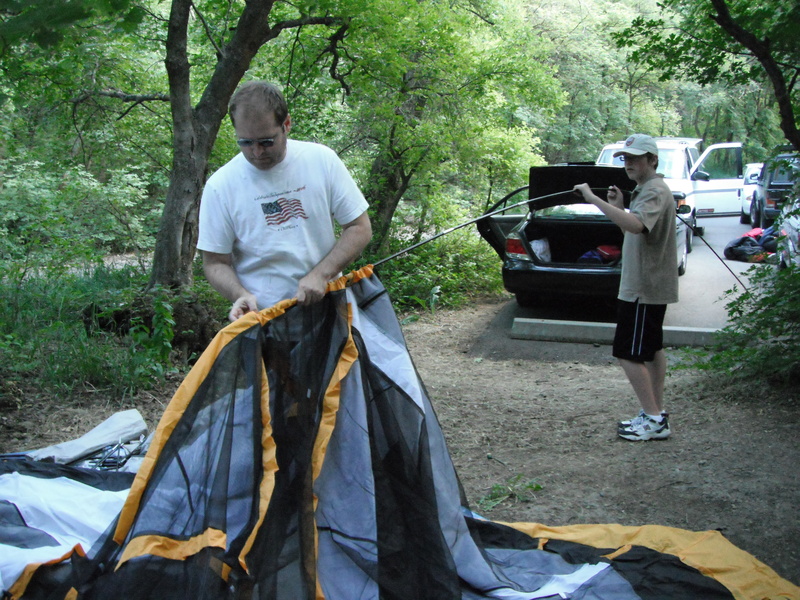 I also have different lists for things like scout campouts, parent get-aways (we definitely don’t do that one often enough), weekend trips versus longer trips, etc. And the beauty is that once these lists are on your computer, you just tweak it a little here and there, print it out and you’re good to go! No more worrying if you’ve forgotten something again, because it’s already on your list. It gets better. Oh yes! Better is always good. #3. Get your kids to help you! Kids are so smart and I’ve noticed that mine love to be put in charge of things. Now for the little ones who can’t read or write yet, either help them yourself or get an older child to help them. They think this is cool when they have a say in what they bring. And we all know how great it feels to be cool in your kids’ eyes! Because it doesn’t last forever. OK, back to the above picture. I told my son to make any necessary changes to his list and get the list back to me. 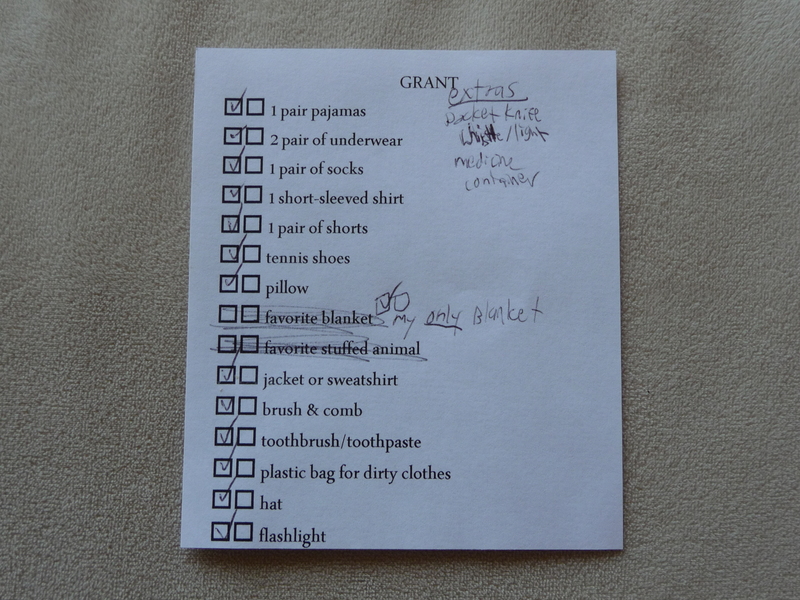 For example, you’ll notice about half-way down the list that it says “favorite stuffed animal”. Well, he’s past needing to take a stuffed animal with him. He also crossed out “favorite blanket” and put “my only blanket” next to it. He also added some things that are important to him now that didn’t need to be on the list before, such as a pocket knife, whistle/light combo thingy (yes, that’s the technical term) and his medicine container. The rest was good. Phew! Guess what I do with his list now? No, I don’t burn it in front of him and claim he doesn’t know what he’s talking about! I’m the Mom! I know what should go on packing lists, thank you very much. No. Humbly, I take his list and update it on the computer. So that’s the next step. #4. Update packing list onto computer and save. And this can be done after camping or after your vacation or whatever you’re making the list for. Don’t stress about getting this part done before you go, because it’s not necessary. Remember, these steps are to help ease your burden, not add to it. Now the next time we go car camping, his list will be more up to date and all will be well with the universe. We’re almost done . . .
#5. Make sure there are 2 check-boxes. This helps both of us. I get to make sure they’ve actually got the correct items in their backpacks, but they’re the ones who’ve pretty much done all the work. And they feel good about what they’ve done and I’ve gotten to spend more time getting my own stuff ready. OK, the last step. And I must admit that I didn’t do this last step this time, but I’ve done it in the past and it helps a ton. No more forgetting this part! #6. Take a piece of paper a notebook or sticky notepad with you on your trip and a writing utensil. As you go about your vacation, write down things you might have forgotten that you really could’ve used and don’t want to forget in the future. So when you get home, you can again, update your list, save it to your computer and voila! Wonderful vacation memories with a lot less stress! This entry was posted in Uncategorized and tagged camping, computer, packing list, vacation. Bookmark the permalink. Sometimes it’s really that simple, isn’t it? I feel a little stupid for not thinking of this by myself. You’re so funny Jenn! Amazingly, I typed my packing list on the computer before we went camping this time because I had the idea several years ago that it would make my life easier but it took me this long to finally do it. I’m very slow. I really like the idea of having a list for each child and having them update them. Nice!